Big Update (As on 27th Dec 2017): On 14th Dec 2017 Govt.has announced the SRO-508, mentioning New Rules for Recruitment of Teachers in J&K. Changes have been made only in the "Method of Recruitment". For Details, kindly read this post until the end. Now, as the SRO is announced, it looks, that JKSSB Teacher Recruitment will be announced soon and most probably in Jan/Feb, 2018. If you are one amongst those who have been preparing for government jobs in J&K and especially in the teaching line, here is a big news for you!! 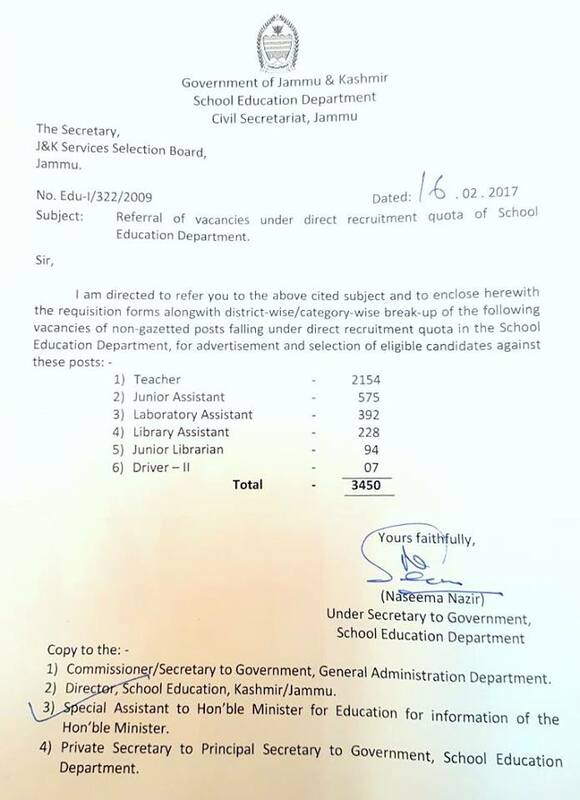 The Education Department of J&K has announced the Bumper JKSSB Sponsored 2154 Teacher Recruitment in 2018. It is worth mentioning here that this JKSSB Teacher Recruitment 2018 will be biggest in terms of vacancies. 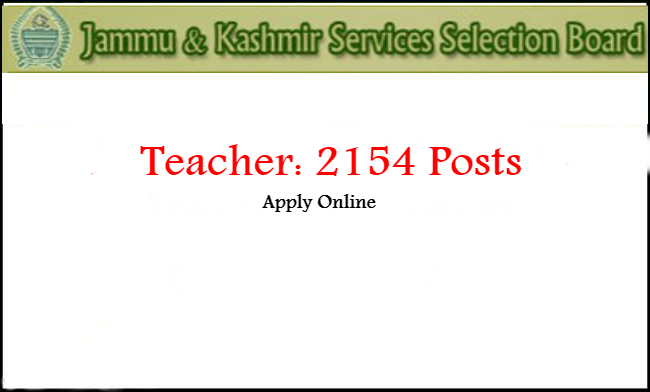 If, you remember, Last time, the teacher Jobs in J&K ware advertised in 2013 for over 5000 posts. The year 2013 has been one of the Golden years in terms of Job creation, as JKSSB single-handedly created close to 19000 Government Jobs. Now, JKSSB is back, with another opportunity for teacher aspirants and particularly those who missed Or Not selected for the Teacher Recruitment in 2013. It is worth mentioning here that for the First time in 2013, Written Exams were conducted for teacher posts, in which over 1.5 lakh candidates have appeared. The reason for such a bigger appearance in JKSSB teacher Exam is the Eligibility criteria that was only 12th Pass, now the present government has amended the Rules and Fixed Graduation as minimum criteria to apply for teaching Jobs. With this change in Qualification criteria, the competition will be lessened, as Only Graduates can become teachers in J&K. Now, everyone here would like to know when this JKSSB Teacher Recruitment will be announced, What is the Syllabus and Pattern for Exam, and many other Questions. In this post, we will discuss each and every aspect and if you still have doubts, you can ask your Questions, in the comments section. What is the Eligibility Criteria for Teachers? 2) Age-Limit: Applicant, must have attained the age of 18 years and the maximum age should not exceed 40 years. The cutoff Date for Determining the Age Criteria is 1st Jan, 2017.
i) General Teachers: Any One who is a Graduate in any Discipline, can apply for General Teacher Posts. Those having Integrated Post Graduation Degree of 5 years are also eligible. 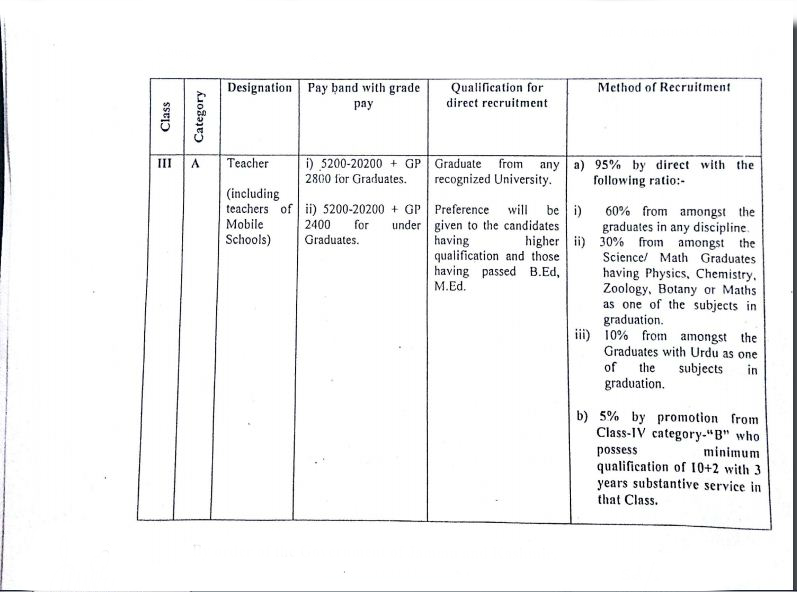 Note: Engineering Graduates who have studied these Subjects in their First/ Second Semester (1st Year) are not eligible to apply for Science / Maths Teacher Posts, as Candidate is required to have studied One of these Subjects, in all the Semesters / Years of their Degree, however, they can apply for General Teacher Posts. The Selection criteria for the recruitment of teacher through JKSSB comprises of Written test (85 Points) and Preference for B. Ed, M Ed and Higher Qualification (15 Points). However, the Written exam is the deciding factor for your selection, as it carries the maximum weighatge of 85 points. Written test: The JKSSB Written test for teacher exam carries 85 Points. Marks obtained in the Written exam, out of Total marks, will be converted proportionately out of 85 Points. Final Merit: The Final Merit comprises of Marks obtained in Written test (Converted Out of 85), and Points obtained in the Higher Qualification. On 7th Sept, 2016, the education department had released the SRO-290, that contains the Rules for Recruitment of teachers in Future. As per the SRO, 95% of teachers post's will be filled by Direct Recruitment and 5% by Promoting Class-IVth Employees of the department. 1) Amongst under Direct Recruitment posts, 60% of posts are to be filled with those Having Graduation as minimum Qualification, with preference to candidates having the higher qualification and Professional Qualification like B Ed / M Ed. 2) 30% Teacher posts, will be filled from Science / Maths Graduates, ie those having Physics, chemistry, Biology, Zoology and Maths as one of their subjects in graduation. Till the announcement of Notification, there was a lot of uncertainty regarding the Syllabus, as recently JKSSB had changed the Eligibility of Teachers from 12th to Graduation. Earlier the Teacher posts come under the "Posts with basic Qualification as Graduation " and such it has a Syllabus as we have for JKSSB 10+2 posts. On 28th Dec, 2017, JKSSB has announced the much-awaited Notification for 2154 Teacher Posts. It includes 1296 General Teachers, 644 Science / Maths Teachers and 214 Urdu Teachers and as these Posts are announced with different Eligibility Criteria, therefore the Syllabus for these 3 Categories of Teacher posts is Different Too. Here is the Exclusive page on JKSSB Teacher Criteria and Syllabus for JKSSB Teacher Exam 2018. Without Books, preparation means nothing. If, you manage to get the right books for the Exam, you work is half done. The market is flooded with Books, that has nothing, as far as syllabus is concerned, but everything, when price is concerned. To help applicants in Finding the suitable study material, we have done an exhaustive research, to Find Out which books, Toppers have studied in the Previous JKSSB Exams. We find, that most of the Qualifiers, have studied the Section wise Books for the Exam, rather than a single Book. For History, Civics and Science, students have given preferences to NCERT Books. For J&K' GK, students have read R Gupta's Book on J&K's General Knowledge. For Current Affairs, they have read the Last Six Months of Pratiyogita Darpan, CSR and GKT. i) 60% from Graduates in any discipline. iii) 10% of Urdu Graduates ie Those who have studied Urdu as a subject at Graduation Level. 2) 5% by Promotion from Class IV Category B who possess minimum qualification, of 10+2 with 3 years of substantive service is that Class. It looks, JKSSB Teacher Recruitment may take some time, as JKSSB is busy with conducting the Written Exams for Pending posts. It is only after JKSSB conducts the Pending Exams, we can expect the announcement of JKSSB Teacher Notification 2018. Today, Education Department had referred 3450 posts in School Education Department to the J&K Service Selection Board under the Direct Recruitment Quota. This means, very soon JKSSB will announce these much-awaited Teacher Jobs in J&K. Apart from teacher posts, Education Department had referred many other vacancies too. Why Government has Revised the Criteria for Teachers? This is gonna be a bad news for all those, looking for Teacher Jobs after 10+2, Now, gone are the Days, when you can dream of becoming a teacher after 10+2. It is not a hidden fact that from past few years, there has been an outburst amongst people regarding the degrading quality of education, especially in government schools. According to UNESCO’s 2013-14 “Global Monitoring Report on Education for all”, it came out that India is still one of the 21 countries that has less than half of the children who know basics of individual subjects. Given this scenario, it is the need of the hour to check our implementation strategies and come out with a new version of recruiting teachers who impart knowledge and educate the young minds. Taking this forward, the J&K Govt. has decided to amend the rules for recruiting the teachers. This is also parallel to the decision made by other states in terms of making the recruitment of teachers more stringent. A SRO would be issued by the J&K Govt. shortly and likewise around 3000 posts of teachers will be filled by the recruiting agency ie JKSSB. This change comes after an elaborate exercise conducted by the School Education Department on the directions given by the Minister in charge Naeem Akhtar. Moreover, state Government has a few more reasons to make this change. 1) The current eligibility qualification of 10+2 education is not sufficient and it needs to be upgraded. Also, another contributing factor is that the current recruited teachers are not able to meet up to the expectation of the students and henceforth the Govt. wants to initiate steps to fill in this gap. Moreover, in the recently announced JKBOSE 12th class results, the performance of Government schools remains poor. Even. Now, from this, you can judge, the level of teachers in J&K. 2) Adding on to this, another keen observation is that the government teachers do not extend their existing knowledge by attending seminars, conferences or orientation programs which keep the teachers updated. 3) To get, promotions, the teachers with Qualification of 10+2, obtain their degrees from universities which are unrecognized even though the criteria for promoting teachers to the Master's Grade is at least graduation with BEd. Moreover, when these teachers, who obtained degrees from Un-recognized Universities, are denied promotions, they enter into litigation with the government. So, all these factors have urged the Govt. to amend the current selection procedures for recruiting teachers. So from now on, graduation would be a basic qualification for roping in teachers which would also eventually help in the promotion of teachers to Master’s Grade. Another important change which will come is that under the amendment rules, 30% of the total posts will be reserved for subjects like Mathematics and Science. This is because of the shortage of the teachers teaching these subjects. According to the National Assessment Survey, most of the students scored only between 0-50% in these two subjects. All these changes are all steps to provide quality education and bring the students in J&K at par with the students belonging to other states. This will prove to be an important and big step towards changing the education scenario in the state. Now, you know why the Criteria for JKSSB Teacher Jobs is changed. Now, the next thing, you would like to know, that when JKSSB will announce the Recruitment Notification for teachers. When JKSSB Teacher Recruitment will be announced? There is nothing, a s fixed timetable for announcement of teacher Notification by JKSSB. As Govt, has said, that they will amend the rules and SRO being issued shortly. It is only after the announcement of SRO and that School Education department will refer the exact no. of vacancies to Board for advertisement. However, it is expected that this much awaited recruitment will be announced in Jan / Feb, 2018. This is just a prediction, and exact date will be known, only when the JKSSB releases the Official Notification. JKSSB is also somewhere busy, and wants that already cancelled and postponed exam of 25th Dec, 2015, should be conducted, this could be on their priority list, as JKSSB had faced a lot criticism over mass copying in this exam. You can apply only after the JKSSB Recruitment will be announced. The Process for submitting the application is online only and as such you have to submit the application by loging on the official website of JKSSB. Application Fees: JKSSB had slashed the Application fee from Rs 400 to Rs 350/-, that can be paid, in the form of a System Generated Challan form in any J&K Bank branch. Applicants are advised to retain the Copy of Receipt of Challan, as it is needed for a future course of action. We will update this page, once JKSSB will have some official word on the announcement of Notification. Also, we will keep you update, if there is any news on JKSSB Teacher recruitment 2018. Applicants are advised in their own interest to regularly visit our website Or alternatively you can Bookmark (Control+d) this page, so that, you can open this page anytime. On 5th June 2016, JKSSB after a gap of almost 6 months, announced the First Recruitment Notification of 2016 for over 1100 posts. The posts include Jr. Assistant, Female Multipurpose Health worker, Teacher, Lab Assistant, Library Assistant. Bulk of these posts are for Educational and Health Department. JKSSB Written Exams Schedule Announced ! After much delay, JKSSB had finally announced the Schedule of Pending JKSSB Exams. You, will be surprised to know, that JKSSB had to conduct the test for some posts that have been advertised in 2005. Think about those, who have applied for JKSSB Notification of 2015 and they have to appear for exams some 12 years late. How many of them remember It ? and How many of them get overaged. This is irony of JKSSB and it won't be wrong to say, that it is Laziest Recruitment agency in India. For complete Schedule of Upcoming JKSSB Exam, you should read our previous post on JKSSB Graduate Level Exams, in which we have discuss the Complete Schedule, along with Notification No.s for which the exam is scheduled in March, 2017. If, you are fed up with the Lazy and slow recruitment process of JKSSB, then, you should consider applying for Central Government Jobs. 3) SSC MTS for Matriculates. (I) SSC CGL 2017 : In 2017 ,CGL Exam is tentatively scheduled to be held in June/July 2017 and SSC CGL 2017 Notification will be announced on 11th March, 2017. (II) SSC CHSL 2017 : SSC had conducted the CHSL 2016 Exam from 7th Jan, to 8th Feb, 2017. Now the next CHSL Exam is scheduled in Nov 2017 and the Notification for this exam, will be announced on 5th August 2017. 4) Books for SSC CHSL 2017 Exam. (III) SSC MTS 2017 : MTS stands for Multi tasking exam. This exam for Matriculates looking for Government Jobs after 10th Class. Notification for SSC MTS Exam is already announced and Online Registration closed on 3rd Feb, 2017.
wt about jammu? we also need govt. jobs. I am from Jammu. So can i apply for kathua or samba district??? Name of Distt where vacancies of jr Lib exist not mention. Request updation. Those candidates who have their results of graduation final year withheld and expectedly get their graduation cleared before the written examination should be allowed to apply for the post of teacher so that they too can be benefitted.Otherwise this policy looks unjust for them. I have completed Bachelors in medical lab technology, Am I eligible for teacher post. Update JKSSB to KSSB. As no post for jammu region.There is no need of joining jammu to JKSSB. I am Urdu graduate, can I submit one application for Urdu as well as general teacher. link of teacher post please..